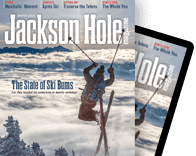 “If you can learn to know what the things are that fill you up, Jackson presents an opportunity to experience almost anything,” says sixty-three-year-old Missy Falcey. 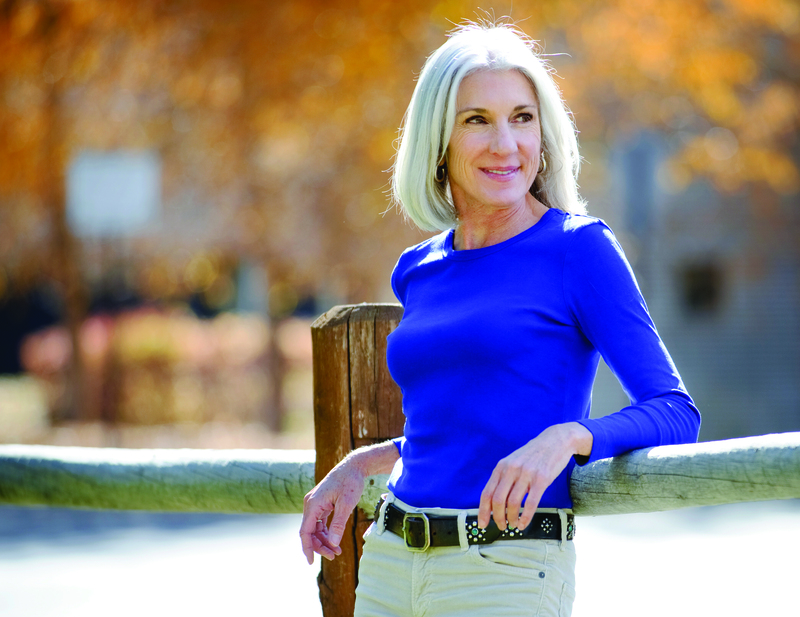 After fifteen years as its executive director, Falcey retired from the Teton County Library Foundation in January 2014. She “spent four months really trying to learn to be quiet” and also getting out and enjoying Jackson, she says. And then Falcey, who from the mid-’70s through the early ’90s lived in the San Francisco Bay Area (and was a guest at Jerry Garcia’s wedding! ), got even more involved in the community than she had been. Today she teaches yoga and a men’s-only balance and flexibility class, volunteers mediating disputes in small claims court, is part of a collaborative project looking at water quality in Fish Creek, and is a newly appointed member of the Town of Jackson Planning Commission. “One of the reasons I appreciate Jackson so much is that everything is so accessible. An individual can really feel like they’re helping to shape the community,” she says. Q: What was it about this community that first grabbed you? A: Moving here and going almost right to work raising money to build a new library—the library was still in a log cabin in downtown then—showed me how much the community is rooted in philanthropy. That really distinguished, and still distinguishes, Jackson. Q: Why did you move here? A: We were living in Marin County [California], and my husband at the time really wanted to move to Wyoming. He came out by himself and optioned a ranch you had to go through the Wind River Indian Reservation to get to. Q: But that’s about one hundred miles from Jackson. A: Right. That ranch didn’t work for me or our two girls. We’re talking about a family used to life in Marin. Driving back to the Jackson airport, we decided to stop in Jackson. We pulled up to the Town Square. It was April and town was dead, but it looked like a place we could try. Q: What’s it like running a stretching class for guys? A: Fantastic! It attracts very, very fit guys who are generally muscle-bound from backcountry skiing and mountain biking, and are coming to terms with their inflexibility. Q: Has Jackson changed you? A: I’m not a different person, but I do have a very different life than I did in Marin. Jackson has allowed me to discover and express parts of myself that never would have been tapped in Marin. Jackson nourished needs I have for the outdoors and living in a small town. Q: What’s the common ground beneath the different groups and projects you’re involved with? A: I’m protective of this community, not in a pull-up-the-ladder kind of way but of making a community that serves the people that are here today. Q: You’re an avid fly fisherwoman and were on the winning team at the 2009 One Fly Competition. What does fishing do for you? A: For me, fishing is about standing in a river with water all around you. That’s my place. Like yoga, it’s an incredibly meditative experience. Sounds pretty woo-woo, I know. A: I’m not a very good five-year plan kind of person. I’ve just been so fortunate to be in places and situations where interesting, rich opportunities have presented themselves. I’m pretty sure I’m done moving, though. I can’t imagine where I would go after living in two of the most magical places in the country.